Often used interchangeably, some refer to the gearbox as the transmission or transmission box. Cars must be able to transition in order to provide enough power to the engine under a variety of different conditions and circumstances. For instance, when going up a steep hill it’s important that your car is able to adjust to the power it requires in order to get up the hill. The transmission or gearbox is the main component that’s responsible for providing this power to the car. The gearbox is responsible for generating torque by shifting gear ratios—this alters the power that’s dispersed to the wheels. The gearbox also performs important functions like shifting the vehicle into reverse or neutral. As you can see, the gearbox is especially important for your vehicle’s performance. The causes of issues with a gearbox can usually be attributed to one or more of the various components of the gearbox. It’s important to keep up on routine maintenance tasks so that the components of the gearbox can remain in good condition. This ensures that your car will be able to handle a range of different conditions while driving. Since issues can occur with any number of gearbox parts, it’s critical to have an automotive specialist perform a thorough diagnosis to narrow down the focus of treatment—otherwise, you may wind up paying for unnecessary repairs and part replacements. •	Leaking oil from gearbox – valves, gaskets, and seals can become corroded and faulty over time, which often leads to oil leaks. This is problematic, as the gears in the gearbox, as well as other components, depend on adequate lubrication for optimal gear shifting. 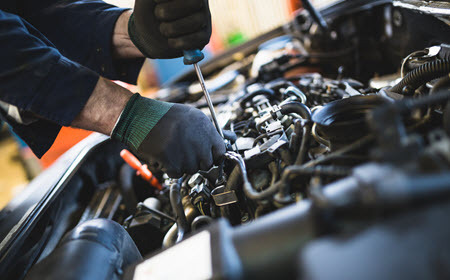 •	Especially noisy gearbox – squeaking or rattling noises are especially concerning, as it often indicates that parts are worn or in need of replacement. •	Overheating – if you notice smoke coming from your gearbox, it could mean that it’s overheating. This can lead to catastrophic damage and expensive repairs, so it’s important to address these issues right away. Preventing gearbox issues is important to keep your car performing optimally, but it’s also important to retain your car’s value and reliability. Gearbox issues can lead to expensive repairs if they go overlooked for any extended period of time, so it’s best to try to avoid them all together. Here are some steps you can take to keep your car’s gearbox in good working condition. First, it’s critical to hire an automotive shop that specializes in the type of vehicle you drive; this will ensure you the best quality care and prevention strategies. Your vehicle specialist should perform frequent inspections of the gearbox and its components and adhere to the manufacturer’s ongoing maintenance schedule. Lastly, following up on suspicious symptoms in a timely manner can prevent issues from worsening. Here at Tech Plus Automotive, we proudly serve clients from Scottsdale, Phoenix, Paradise Valley, & McCormick Ranch, AZ. It’s not easy finding quality automotive care for vehicles like BMW, Jaguar, Land Rover, Porsche, Volvo, Acura, Infiniti, Lexus and Mercedes, which is why we’ve dedicated ourselves to providing expert services at an affordable rate. As the leading dealership alternative in the area, it is our mission to make automotive expertise attainable. If you’d like to learn more about gearbox issues and how to tackle them, please contact us directly to speak to a helpful automotive expert.